This tee was probably not a good choice today. The back is completely see through so I had to wear a singlet underneath to cover up for the office, and it was a little warm with the extra layer. Maybe on cooler days, or paired with a skirt. Today I bought some more items from the Cotton On online sale, and broke my Buy Nothing New month pledge to not buy anything new in October. A few ladies at work were putting an order in online together to get free shipping, and I had another look and as most things were $5, bought a few things. Shopping after only 5 days!!! Need to do better and not buy any more this month. The sunnies were last worn here, jeans here, shoes here and bag here. This is the first time I've worn the top as it's a new purchase. Great outfit. I really love . 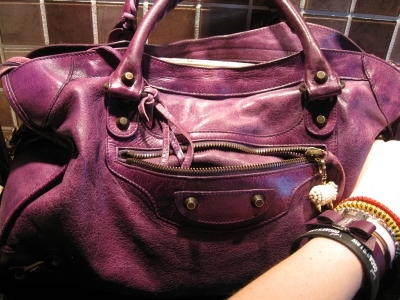 Love the fit of that top on you, and the purple bag is a great splash of color! :) Have a great weekend. Best wishes for you to keep working on this blog so nice. That bag is insanely cool. The color is perfect. The minute I make a shopping ban is the minute I want to break it.